In spite of the many five-star developments in the area, Jimbaran Beach remains unspoilt and tranquil, the pace is still unhurried, the atmosphere relaxed and the sand soft and golden. The entrance to the bay is blocked by an unbroken coral reef, so although the calm water is not suitable for surfing, it is a safe haven for swimming. During the daytime it attracts guests from the nearby resorts, together with the occasional windsurfer. In the late afternoons, Balinese families come down to the beach. Kids paddle in the shallows and build sandcastles that are more reminiscent of miniature Taj Mahals than of Norman fortresses. Ice cream pedlars cruise for custom on pushbikes, dogs gambol through the sand, young men play football with makeshift goalposts, and the delectable smell of grilled sweet corn blended with charcoal smoke emanates from food trolleys parked at the water’s edge. If you like your villas sleek and polished then you are going to love the gleaming surfaces and modern fixtures of Villa Adenium. I found myself constantly sliding my hands over the glossy furnishings and marvelling at the smooth surfaces under foot. Constructed in 2006, the villa has been beautifully maintained and everything feels so shiny and new, it could have been built just yesterday. The hard angles of the design were a little sharp for our taste, but the effect was softened in the evenings with the gentle glow of down-lights, hurricane lamps and wonderful wall lights stencilled from black steel. Views were limited from the ground floor and the pool takes up most of the outdoor space, leaving little room for a garden, but it is still a great spot for lounging, especially while sprawled across cushions in the balé. The views were better upstairs and our favourite spot was on the veranda, where we could ensconce ourselves in the comfy planters chairs, with feet resting on the foot stools – perfectly positioned for a sundowner! 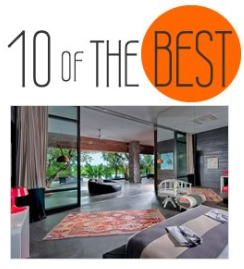 Bedrooms are in the style of contemporary hotel suites, comfortable, minimalist and immaculate – if you’re looking for a rustic homely vibe this is not really the villa for you! With three floors to spread out across, the villa has plenty of space, and the well-equipped basement is an added bonus, especially for ping pong masters such as ourselves. The deliciously fluffy breakfast pancakes served with ornately carved tropical fruit and excellent coffee also deserve a mention. 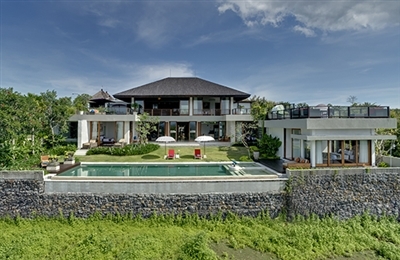 This villa rocks! We loved our stay here – one night wasn’t enough time to sample all the facilities. There really is something for everyone: a gym; yoga space; massage room; pool lounge; PlayStation and great stereo systems and cinemas throughout. There are also plenty of spots to relax and sunbathe by the fabulously deep saltwater pool (I had to equalize when diving to the bottom of the deep end! ), or snuggle up with a good book and enjoy the ocean view. 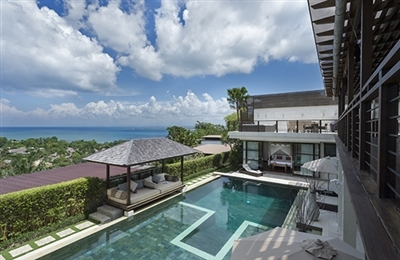 The owners of this villa obviously have kids – we know that from the name but also because this is one of the best-equipped villas for children we have seen. Apart from the PlayStation 3 there are numerous games and toys to keep them entertained – even children-sized pool cues! And a safety fence can be erected around the pool to give parents peace of mind and save them from having to double as lifeguards. And with three home cinemas, plus three more TV’s there’s never any fights for the remote! Jamalu works for all ages, and as well as making a great family holiday villa it’s a wicked party pad; the Bose stereo system links to speakers in all the living areas and outdoor speakers by the pool and on the first floor terrace. The villa manager has been with the villa since the start, and the chef is very accomplished. 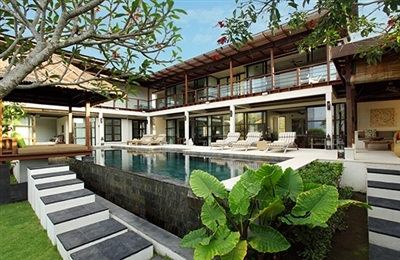 This contemporary property may not be suit those looking for a traditional Balinese experience. However all the interiors are furnished very tastefully in the best quality materials and fabrics creating a very comfortable environment. There is something very easygoing about Villa Uma Nina, and we thought this must have been down to its serene situation and its beautiful presentation both indoors and out; we felt at home the moment we stepped inside. Uma Nina is a great family villa; the garden is almost flat, despite the property’s hilltop location, so it’s great for children of all ages; there’s also a slide for the swimming pool, not to mention tortoises in the pond, which kids will absolutely adore. A sand petanque pitch at the bottom of the garden and games such as croquet provide further entertainment. Rooms in the main house are equally sized and come with their own private balconies or verandas making the villa good for friends and couples sharing. The upstairs bedrooms and rooftop terrace, were the absolute best for gazing at the views of harbour and sea. Stone stools and petrified wood seats might not encourage you to stay seated up here for too long, but they look great and, along with many other natural furnishings and fittings, provide the villa with plenty of character. Service was generally good and the manager was very attentive. We enjoyed the meals prepared for us by the villa cook, though if you wish to self-cater the kitchen is well-equipped for it. 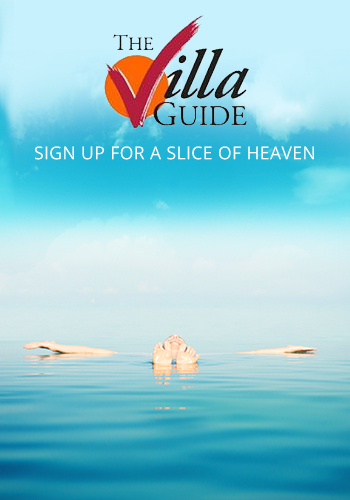 Alternatively, take advantage of the villa car and driver and go out to eat in Jimbaran.